In my most recent posts, I’ve defined shared reading, explained how it’s different from a readaloud, and given some tips for choosing great texts for shared reading. Now it’s time to really dig in deep! In my next few posts, we’re going to talk more about the “what” and “how” of shared reading. In this post, I’ll suggest some fluency strategies to teach during shared reading (for K-2), provide a freebie, and share my favorite materials for teaching fluency (like this book)! First of all, what is fluency? It’s not just reading quickly! Reading fluency is both an indication of comprehension AND a pathway to comprehension. It’s an indication of comprehension because reading fluently involves reading with expression, phrasing, etc. that reflects the meaning of the text. It’s a pathway to comprehension because developing fluency, particularly accuracy and automaticity, can free up the reader’s attention to comprehend the text. Many instructional activities help develop fluency, including teaching phonics and sight words so that kids can decode words in the first place. But for the purposes of this post, let’s focus mostly on prosody, phrasing, stress, and attention to punctuation. 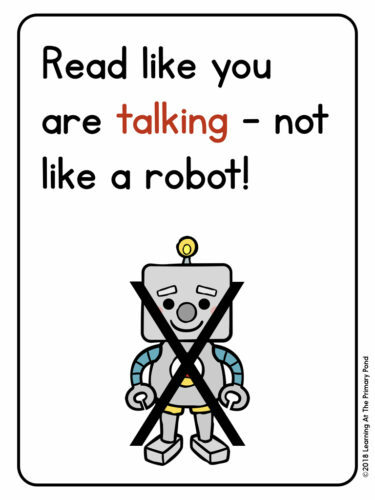 Strategy #1: Read like you are talking, not like a robot! 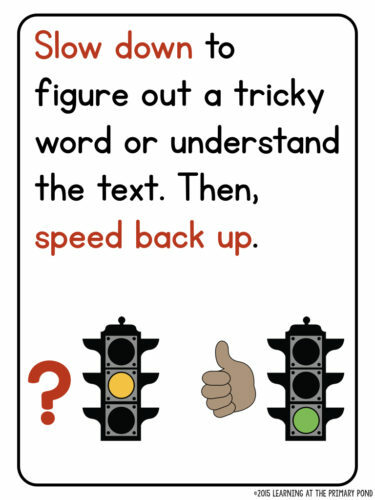 This is usually the first fluency strategy I teach my Kindergarten students (but older kiddos may need to learn it too). I revisit this quick lesson regularly (by reading in a monotone voice and having students correct me). I always follow it up by modeling proper fluency and having students join in. 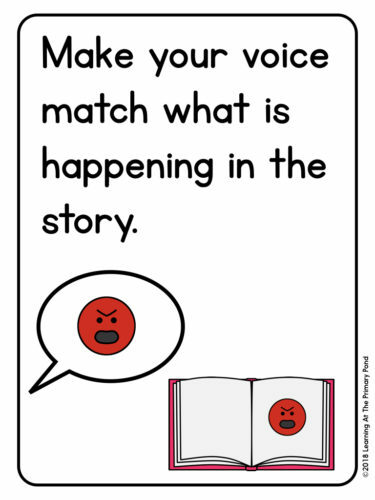 Strategy #2: Make your voice match what is happening in the story. Once you and your students have read a story once, revisit it with the purpose of teaching this strategy. Before you read, have your students help you make a “fluency plan.” Page through the story, showing them the pictures. Ask, “In this part of the story, how should my voice sound? Why?” You can also discuss how different characters’ voices should sound different (and reflect character emotions). After you’ve made your plan, you might do some quick modeling and then invite students to help you practice this strategy as you reread. 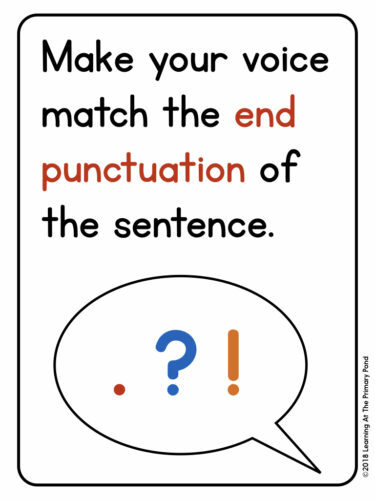 Strategy #3: Match your voice to the ending punctuation. When we get to a period, our voice goes down at the end. When we get to a question mark, our voice goes up. When we see an exclamation point, we read with lots of emotion. And our eyes skip ahead to check the ending punctuation mark so we can read each sentence accordingly! 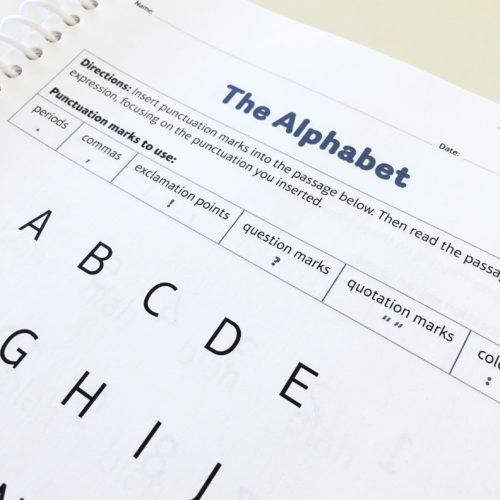 If you want to focus on ending punctuation during shared reading, you can have students go through a familiar text and help you mark the punctuation marks (perhaps with highlighting tape or sticky flags). Then, begin reading together. Since the punctuation marks are highlighted, it’ll be a bit easier for students to attend to them as they read. 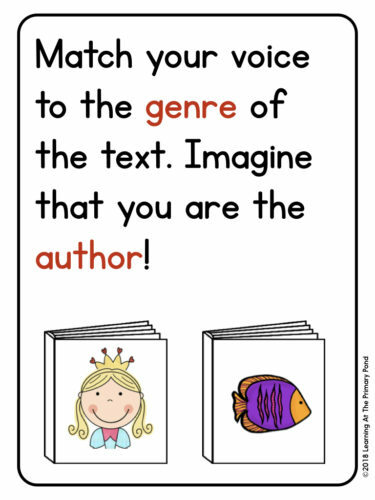 Strategy #4: Match your voice to the genre of the text. Imagine that you are the author reading the text! In some ways, I think expression can be easier and more fun to teach with fiction. We pretend to be the characters for the dialogue parts and storytellers for the narration parts. But expression still matters when students read nonfiction! When we are practicing reading nonfiction with expression, I ask my students to imagine that they are the authors of the book. The topic of the book is obviously interesting to the author, and he/she wouldn’t read it aloud in a monotone voice! 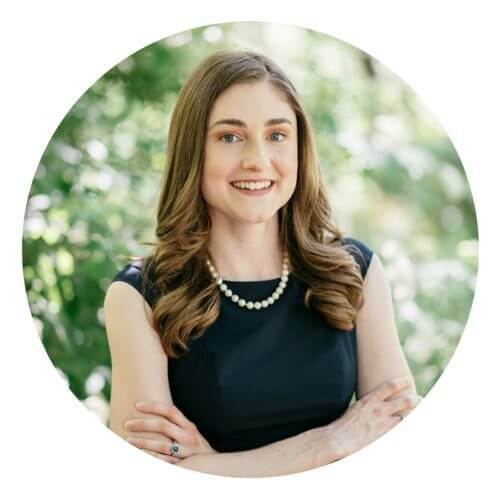 I also encourage them to pay plenty of attention to ending punctuation marks, as this will also affect the expression with which they should read. 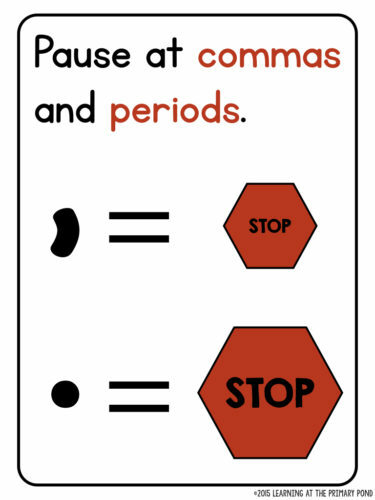 Strategy #5: Pause at commas and periods. I teach my students that a period is a small stop, and a comma is an even smaller stop! Again, just like with Strategy #3, you can have students help you highlight these punctuation marks prior to rereading a text. Another fun thing to do is play “These don’t belong here!” You can write commas and periods on sticky notes and allow a few students to place them wherever they’d like on a few pages of your shared reading book. Then, read aloud and show them how different (and silly) the text sounds with those additional pauses. Strategy #6: If a word is tricky for you, slow down to figure it out. Then, speed back up! Do you have some students who tend to speed through a text, glossing over tricky words? Something I do frequently during shared reading is say, “Let’s imagine that there’s a word on this page that is tricky for me. Watch quietly while I show you what I do.” I model how I read the sentence, slow down to figure out the word, and then restart the sentence to get back to my original reading pace. I tell students that it’s a good thing to slow down sometimes. Focusing on fluency doesn’t mean that we want our students to read so quickly that they don’t stop to problem-solve! 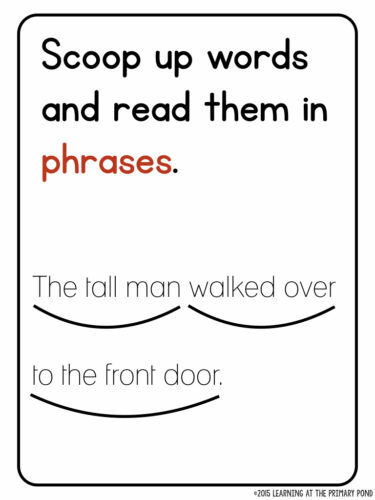 Strategy #7: Scoop up words and read them in phrases. This is one of the more advanced fluency strategies I teach, and I like to teach it with shared reading texts that I can mark up (i.e., articles or printable passages). To work on this strategy, I have students watch me (or help me) mark up a very short text before I read it. Once I’ve modeled reading in phrases, we all practice together. I also model the opposite to show them what not to do (reading word-by-word). Also, teaching fluency during shared reading goes far beyond just teaching these strategies. We practice fluency during just about every shared reading experience. I model fluency as I read to them, we practice it together as the kids join in with me, and I’m constantly pointing out how my voice changes as I read different parts of a text and different texts. The act of reading and rereading the same text, as we do during shared reading, develops fluency in itself. Want to download this list of fluency strategies plus all of these fluency strategy visuals? Fill in your information in the boxes below, and they will be emailed right to your inbox! The nice thing about fluency is that it doesn’t require a ton of “stuff.” It mostly just requires some great texts—ones that students will enjoy reading over and over again! 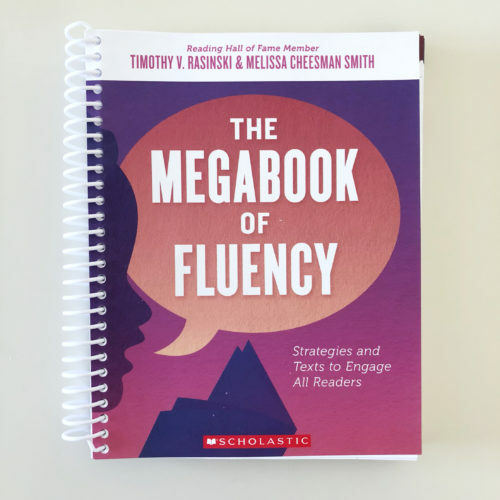 One new resource that is absolutely a MUST-HAVE for teaching fluency is Rasinski & Smith’s The Megabook of Fluency! This book has a ton of fluency activities that can be used in shared reading and beyond. In exchange for sharing about this book, I received a free copy from Scholastic. And BOY did I hit the jackpot!! I’ve been using the activities with some of my summer school reading intervention kiddos, and they are in love! 😍 You can grab this book HERE! 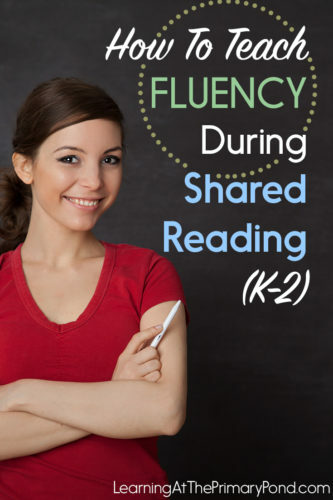 If you have a great idea for teaching fluency during shared reading, please share in a comment below! And don’t forget to grab those free fluency visuals, if you haven’t yet! ← How Is Shared Reading Different from a Readaloud? For second graders that are on or above grade level, do you recommend literacy stations or sustained independent reading? Do you have some material in Spanish to teach fluency? Do have the skill posters (shown above) available somewhere? TPT perhaps? These posters are amazing; thanks so much for the great ideas and amazing visuals! !